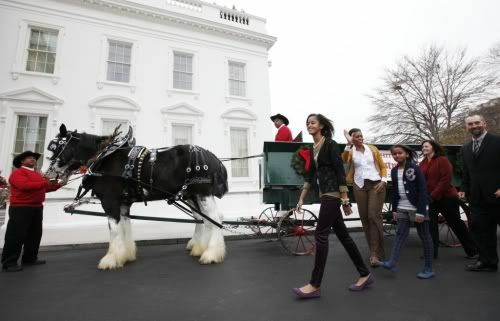 First Lady Michelle Obama along with daughters Sasha and Malia Obama were spotted in front of the White House full of holiday cheer yesterday. 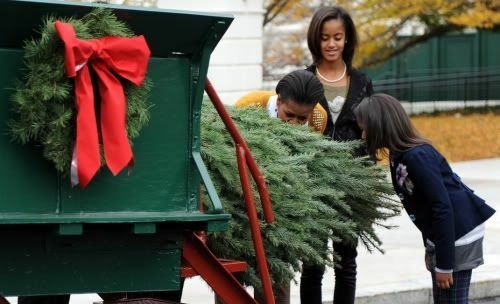 An after Thanksgiving Day tradition, Mrs. O and her daughters received the 18 1/2-foot Douglas fir that will become the Official White House Christmas Tree. 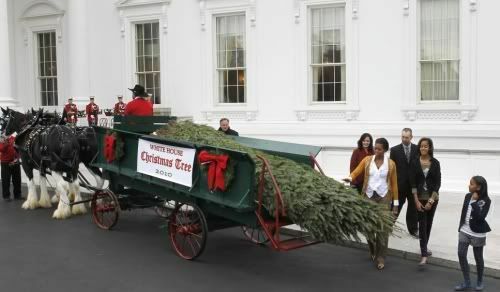 The fir comes from a farm in Lehighton, Pa., belonging to Christopher Botek. 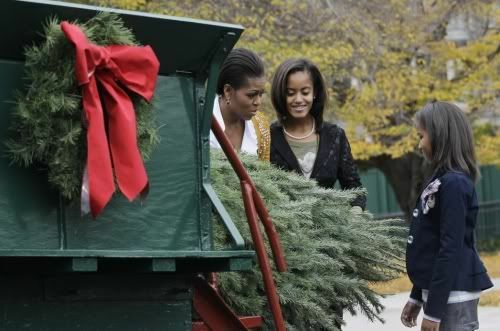 This is the second time that a tree from the Botek family farm has become the Official White House Christmas Tree. 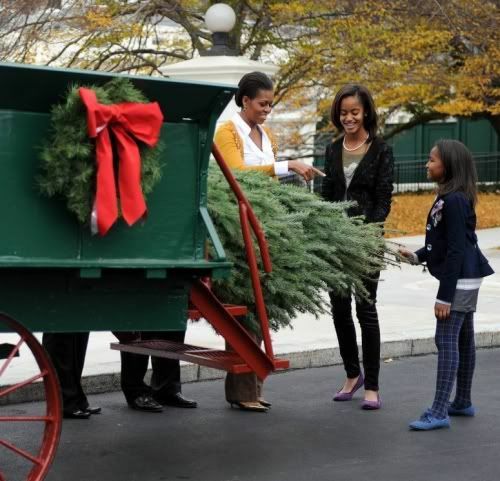 The tree was hauled through the White House gates by horse-drawn carriage and will go on display in the Blue Room. I wonder if they started decorating last night. Loves them. The kids are growing up to be beautiful young ladies. sasha is a model in the makingggg!!!! anyone else think so??? Sasha is a fashion diva!! www.marykay.com/tmcmillan-reed. Order online. Free shipping! BEAUTIFUL! I feel like they are a part of my family that i have yet to meet, lmao!!! luv them! Now if we could only have some jobs underneath that tree....Christmas would be MERRY!!!! This is how you raise your kid's with intellect, poise, and above all respect, you don't have to be born with a silver spoon to achive what the Obama's have, please black america let's strive to be alot better when it come's to raising your own ebonics is not the way and putting some of the rapper's and baby momma drama is not the way either, education is. letgetit you are somewhat right for a change but we need a couple more Barack's in the picture as well I don't see a lot of them in the community either just sayin'....as for the post Sasha and Malia have grown so much ..they are so beautiful LOVES THEM!!!!! Why does Malia have to be a model? Just because she is tall? I hope we can see more for our children than modeling/sports/entertainment. How come she can't be President? No, not because she is tall. No, not because she is tall. Because she is graceful & BEAUTIFUL. What's wrong with being a model? Similar pay to the President and you don't have every terrorist in the world trying to kill you. am i the only one that sees all this damn spam. I like to come to the site because it is dedicated to black people, but sheesh WHAT IS WITH THE SPAMMMMM. I agree with you. Malia is the oldest and she should be a model. What a beautiful family, Sasha (i think she is the tall one) should be a model. It's so cool to watch those two little girls turn into young ladies. They both appear quite independent of each other. I like Sasha's outfit. Malia is starting to looking like a younger version of her mother with her fashion. LOVE, LOVE, LOVE my First Family! They just make me smile! Beeeautiful!!!!! Can we get a profile of the Attorney General's fam? Eric Holder has a YBF bunch, too! Heck, I'd be willing to do the write up! Love this site. Malia is 11 and that tall! Malia is 11 and that tall! Wow! by 13 she'll be taller than her mama and any supermodel out there. Wow! I mean she's only a year older than Willow but so regal and so classy. Wow! Exactly she is so classy and poised. Sasha will be the same way. Malia is about to pass up her mama and daddy!!!! That girl doesn't need to be a model. She already is a model to our young sistas!!!! GO ON MALIA!!!! Love lil sasha too!! Such a cutie patootie!!! They are what our ancestors died for. They are there because of the ones that suffered long before us. Sends chills up my spine! I LOVE BEING BLACK!!!!! I just love this family! so proud of them, setting a great example!!! Ooooh-Malia looks JUST like her daddy in that last pic!! In the next 5 years or so those girls are going to be on the cover of all of the fashion mags. Can't wait. They'll probably be in the front row of all the fashion shows too... Anyone think the ladies will be going to the Royal Wedding in April? Can't stop staring at Malia. Can't stop staring at Malia. She should consider modeling. THEY ALL LOOK REALLY BEAUTIFUL!!!! u actually said something kinda sensible....for once. Lol! I thought the same thing. These kids are absolutely beautiful!!! I love them!! This is such a great look for the black community!!! Now black folks take notice!! This what our families can look like, beautiful, intelligent, black in all shades, and loving!!! OMG I SEE BLACK PEOPLE! FINALLY NATASHA! <3 this young black and fabulous family!! beautiful Malia will be a great model ! Wow, what a stylish bunch! Beautiful ladies, the girls are getting so big! Beautiful!